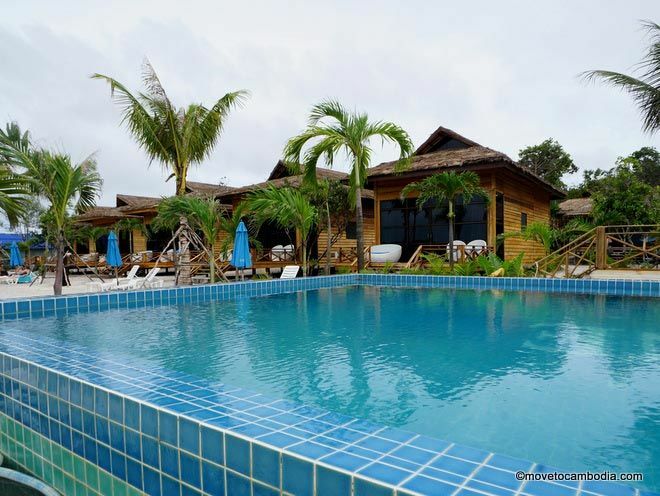 A true island luxury offering, The One Resort boasts beautiful bungalows and a pool with sea views. A little known truth is that the Cambodian islands offer, for the most part, no-frills accommodation. 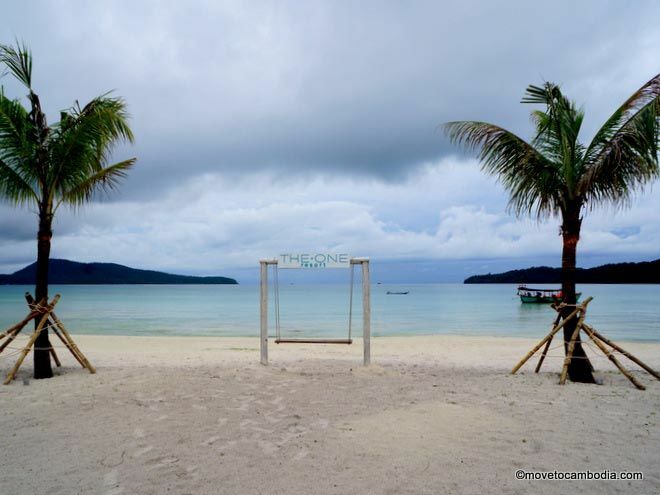 The One Resort is the exception that proves the rule, a proper luxury resort on Koh Rong Sanloem. Double your pleasure by sitting in the pool and staring at the sea. Or vice-versa. The first thing you’ll notice at The One Resort is the infinity pool, surrounded by sun recliners, built directly over the sands of Koh Rong Sanloem, giving swimmers (and loungers) an unimpeded view of the sea. If having a pool that close to the beach isn’t the definition of being spoiled for choice, we don’t know what is. Happily, they only let guests use the pool, so you can keep all of that opulence to yourself. The bungalows themselves are a rare find, and far nicer than most others we’ve seen on Koh Rong or Koh Rong Sanloem. 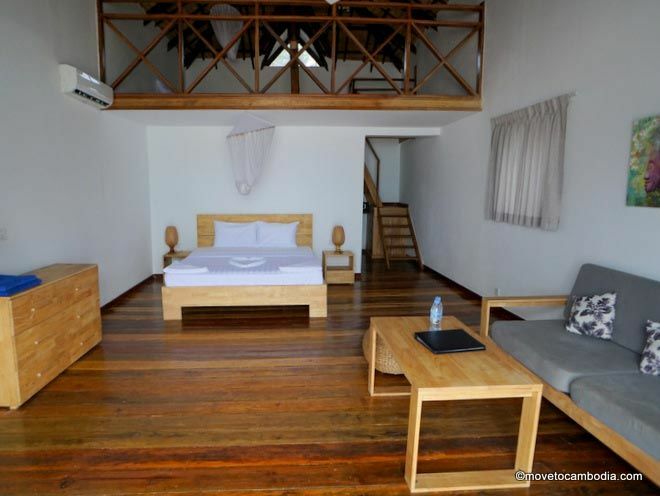 Each is fully air-conditioned, and if you’ve sprung for the seaview bungalow, you’ll be able to gaze on the azure waters of Saracen Bay from your bed — the bungalows have one-way glass sliding doors, so you can leave the curtains open and wake up to a view of the ocean. The large seaview bungalows are lovely, with a double bed downstairs and another upstairs on a mezzanine level. Although the mezzanine is cute, the mattress is on the floor, so it might not make for great sleeping. Each bungalow is fully furnished with clean, modern pieces including a couch and coffee table, and each has a private balcony with seating. The bungalows are on the beach facing the sea, but with reflective glass so you can see out but others can’t see in. We were also impressed by the fact that they have hot water and electronic safes, and that they’re one of the few places on the island to accept credit cards. However, they do not have televisions in the rooms, which may be a good or bad thing depending on your perspective. The family bungalows are in the second row, with a partial sea view. 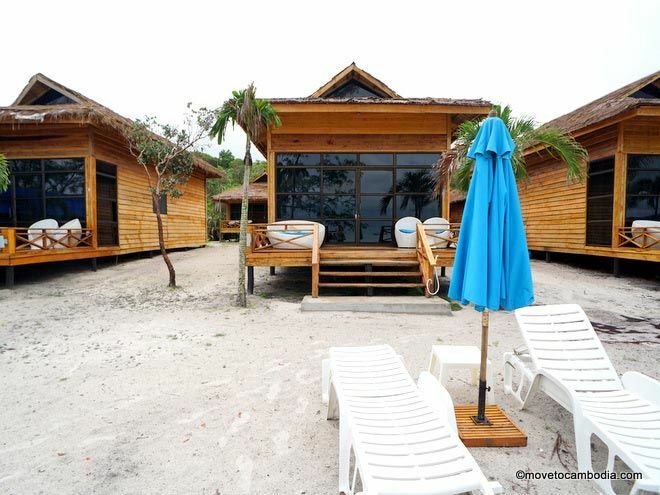 The style is the same as the seaview bungalows, but the family bungalows are slightly smaller. The draw of the family bungalow is that, in addition to the bed in the main room, there’s also a small bedroom with another double bed. The garden-view bungalows and “tree house” bungalows (they are slightly elevated) are in the third and fourth row, and offer a one-bed, pared-down, but still very nice version of the seafront bungalows. Some of the swishest digs on Koh Rong Sanloem (this one is a seaview bungalow). In high season, a garden-view bungalow goes for $90, family bungalows are $116 with double occupancy, and a seaview bungalow is $120. Prices are mostly the same in the low season, although we were told that they would be discounting 20%. To get the full price list, check out Booking.com. The One Resort has a beautiful bar and restaurant that serves a range of dishes from Europe, Cambodia, and Thailand in the $8 to $10 range. We tried a tom yam soup, which was very nice, and the pizza was decent. The brightly lit bar is probably the nicest in Saracen Bay, and worth coming for a drink just to admire the glowing pool. They have a range of creative cocktails priced between $4.50 and $6 as well as wines and actual champagne; if it’s a special occasion (or even if it’s not) you can order a bottle of Moet Chandon for $100. They also have a DVD collection for guests, book exchange, and massage center, with reasonably priced massages starting at $10 for 30 minutes. Again, it was cloudy. It does look like an island paradise when it’s not raining. Room prices increase based on the number of guests in each bungalow. Walk-in rates are the same as what we found online, and the hotel does its official bookings through Booking.com. → Check prices and book a room at The One Resort on Booking.com or Agoda now.